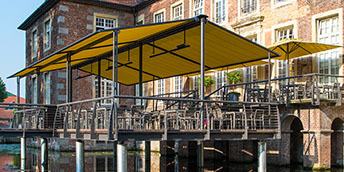 A ‘Butterfly Awning’ is a generic term referring to a free standing retractable awning systems usually with two retractable awnings either side of a sturdy goal post aluminium framework and there are many variations on this theme, especially when your requirement is for commercial use, which the majority are used for. For most commercial applications in the UK the requirement is not only for sun protection but also to provide shelter from the rain. This is where the Markilux Syncra system is ideal as many butterfly awnings are only suitable for sun protection and do not have the strength to be used in wind and rainy conditions. 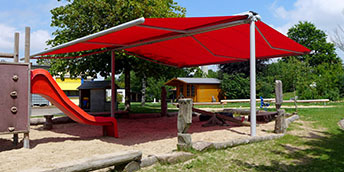 Unlike other butterfly awnings where the fabric cover is only suitable for sunshine, the Syncra has been designed and tested for both wind and rain and is manufactured and tested in Germany where the weather is as diverse as the UK. When you are looking to put a serious all year round butterfly awning system in place then the Syncra may well be your only solution. The Markilux Syncra system is constructed from a strong galvanized steel box section framework available in one piece up to 7 metres wide or as a coupled unit up to 13.9 metres wide. Combine this maximum size with 4 retractable awnings with 4 metre projections and you can cover an incredible total area of 111 square metres! The system is tested and CE approved. 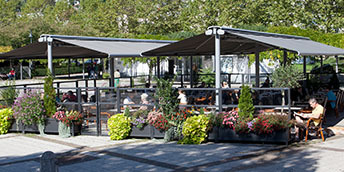 The free-standing awning stand consists of a steel cross member and two steel posts at the side and has no annoying centre support like giant umbrellas can have. It offers plenty of space with a maximum height of three metres and a walk-under height of over two metres to side even at large extensions. 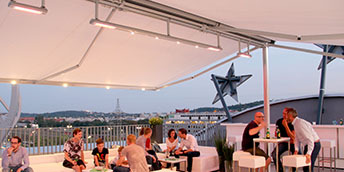 Seven different awning models from the Markilux range are available to suit different requirements and tastes. Whether small and compact or stylish and elegant, with or without lighting. All awning types are equipped with a gear mechanism and attractive stainless steel winding handle; an electric motor is optional. 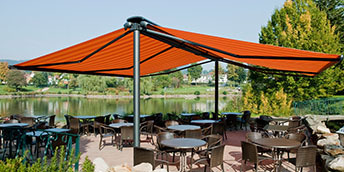 The powder-coated awning stand includes a top profile in the same frame colour as the awning. The cover and mechanism are always well protected when retracted by the totally enclosed housing and top profile. 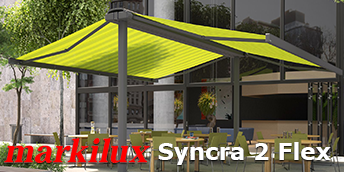 There are a choice of high quality Markilux awnings for the Syncra framework – open, semi or full cassette models, all available as manual or electric operated and a very wide choice of fabrics including fire retardant and fully waterproofed options for public places. 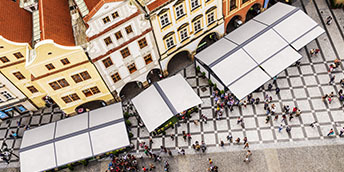 As the awnings either side are independent you can have one awning out on its own if required all depending on the level of shading and protection needed at any one time during the day or night. A wide choice of accessories can be added to the Syncra framework including lighting and infra red heating systems enabling use of the cover during the evening and with additional warmth to extend the evening al fresco experience. Drop down electric or manual operated valances can also be specified with certain models to give further protection at the sides and Samson can also supply fixed side sections either in glazed or solid sections to create a more protected environment to encourage use of the area. The Syncra can be surface fixed or concreted into the ground and there are also options for self supporting models using various weighted sections which can also double up as seating or decorative areas. We would always recommend the permanent fixing for ultimate stability all year round. Samson Awnings also offer the superb Weinor Duofix butterfly awning system and the Terrasol system from Winsol awning but the Terrasol is only used for sun protection and would not be suitable for windy conditions and rain protection. 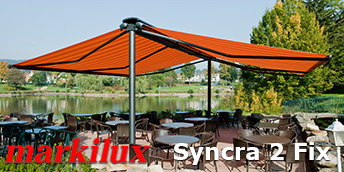 Another fantastic variation on the Syncra is the Markilux Pergola 110 and 210 system offering even greater levels of stability for self supporting terrace and patio cover with huge variations in size and specification. Self supporting or fixed to an existing structure the Pergola offer real protection in our variable UK climate.